From yesterday: I just got back from dinner at this little restaurant I’ve passed a couple of times called Havana 61. It was totally closed off from the street so I assumed it would have air con (as they call it here). I was glad that I dragged my tired self out of my hotel room at 1830 because the place was small and any later I wouldn't have gotten a table. I was sitting between an older German couple (the woman had the most gorgeous hair!) and a couple about my age, the woman was American and speaking of her phd, the man not American. I couldn’t figure them out, lol. If the rest of the world can see what half of America can see, but moreover the rest of the world sees what half of American CHOOSES NOT TO SEE. Makes me mad and sad. Dare I say it, but I doubt you’d find a Trump supporter in Cuba, Latin America, or mainly anywhere outside of Europe really. Although they’d probably not even venture to France these days given the irrational and misplaced fear of "the radicalized." Near the entrance to Havana's Chinatown, contrasts of decay and restoration. I was caught in conversation with another random guy on my exploring yesterday who was trying to tell me that the American and Cuban governments might not agree but the people are…. “lo mismo” I supplied. Giving away that I understood more than he initially thought. Couldn’t play dumb anymore (: Except when, god help me, some people talk to me and there’s music playing in the background and they seriously have some sort of “country”accent (for lack of a more appropriate term). Then I can’t understand anything and look at them blankly feeling bad. 5. Statue of José Martí holding an infant (his son? a representation of Elián González?) and pointing towards the American Embassy. The statue's plaque reads: To timely impede with the independence of Cuba, that the United States extend through the Antilles and fall, with that force, over our American land. All I have done until now and what I have left to do, is for that. - José Martí, hours before dying in combat. 6. USS Maine Memorial built in 1925 in honor of the American sailors who died in the 1898 explosion of the Maine. Along the José Martí Anti-Imperialist Platform, bookended by the US Embassy on its western end and the USS Maine Memorial on the eastern end. The US Embassy with the Wall of Flags standing in its foreground. In January of 1961, President Eisenhower closed the American Embassy in Havana and severed all diplomatic ties with the country. It wouldn't be until another 54 years and 11 U.S. presidents later (to Cuba's one president) that diplomatic relations were officially restored between the United States and Cuba on July 20th 2015. Previously in 2006, an electronic ticker with 5' tall letters was installed on the fifth floor of the embassy, although at that time it would have been referred to as the American Interest Section Building, NOT an embassy. The ticker was installed under the guise of reporting local news to ordinary Cubans but more often than not flashed criticisms of the Cuban government and pro-democracy propaganda messages. Obviously this was no bueno for Fidel so in response he erected 138 flags at the westernmost edge of the José Martí Anti-Imperialist Platform. The reason given for the black flags was that they represented the victims of the Bay of Pigs Invasion / Battle of Playa Girón and other attacks on Cuba made by the United States. But Fidel knew what he was doing...all those flags waving in the wind successfully served to block the view of the 5th floor ticker's messages. What the Wall of Flags / Monte de las Banderas would look like full of flags. In this view the photographer has his or her back to the American Embassy and the mourning flags have been replaced with the Cuban national flag. Another time when the wall was full. At the end of the plaza is the USS Maine Memorial. The monument was crowned with an American eagle. Its wings extended vertically in such a way that a hurricane damaged the monument the following year. The original eagle was replaced in 1926 by one with horizontal wings. The first one is now in the U.S. Embassy building in Havana. There were originally three busts of Americans: President William McKinley, who declared war on Spain; Leonard Wood, first military governor in Cuba, and President Theodore Roosevelt. (A las víctimas de El Maine que fueron sacrificadas por la voracidad imperialista en su afán de apoderarse de la isla de Cuba. The eagle's head was later given to Swiss diplomats. It too is now in the Embassy of the United States, Havana building. 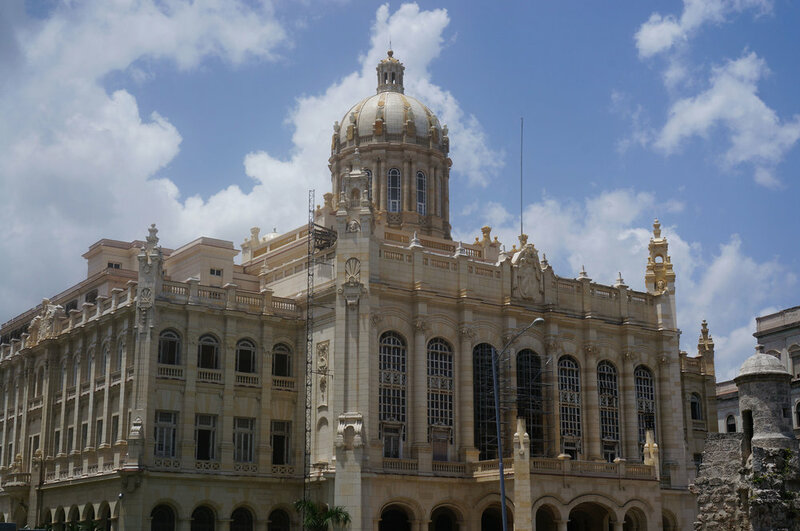 The body and the wings are stored in the Havana City History Museum. The museum's curator believes that good relations with the U.S. will be symbolized by the reunification of the parts of the eagle. USS Maine Memorial - On top, where once an eagle stood. Cuba 'Blocking' American Messages - This one I love because you can see Fidel in that teeny little photo STILL wear his fatigues. Even more on the topic here.